Flooding at Campbell Creek shown in 2017 photo at same time of year. The City of Kamloops has activated its Emergency Operations Centre to support efforts to monitor the rising water in Campbell Creek. 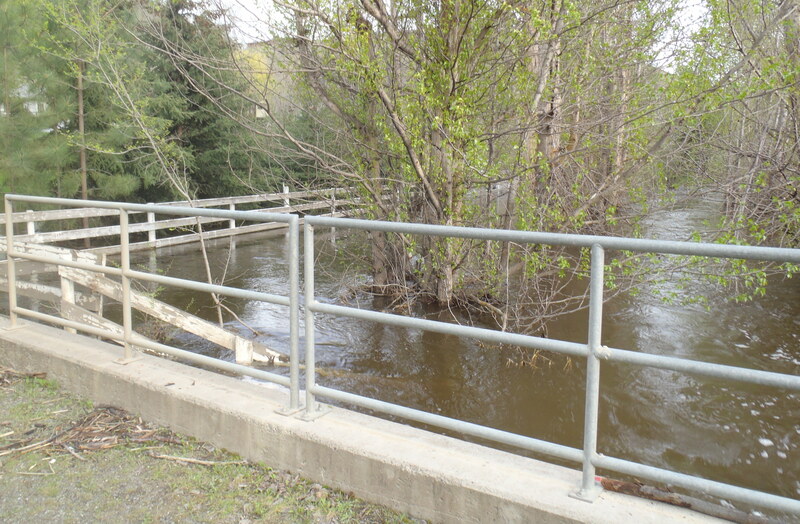 At 8 p.m. on Saturday, May 5, the City closed Barnhartvale Road as water from Campbell Creek began overtopping the road. All traffic has been detoured onto Blackwell Road. City staff is monitoring the water level at the Blackwell Road bridge and has several contingency plans in place should the water surpass 2017 levels. Sand and sandbags are available at the Barnhartvale Community Hall, the B.C. Wildlife Park, and several fire stations throughout the city. Bring your own shovel. For sandbag locations and proper techniques for filling sandbags and creating sandbag dikes, please visit www.kamloops.ca/flood. Residents working alongside waterways, culverts, and river banks are asked to stay as far back from the banks as possible and to use extreme caution. Banks may be unstable as high flowing water can cause erosion under the visible surface, he said.